AYUTTHAYA, Thailand (Thomson Reuters Foundation) - Nestled among hundreds of identical white and brown two-storey homes crammed in this neighborhood for factory workers is a house with a trick - one not immediately apparent from its green-painted drywall and grey shade panels. Hidden under the house and its wraparound porch are steel pontoons filled with Styrofoam. These can lift the structure three meters off the ground if this area, two hours north of Bangkok, floods as it did in 2011 when two-thirds of the country was inundated, affecting a fifth of its 67 million people. The 2.8 million baht ($86,000) amphibious house in Ban Sang village is one way architects, developers and governments around the world are brainstorming solutions as climate change brews storms, floods and rising sea levels that threaten communities in low-lying coastal cities. 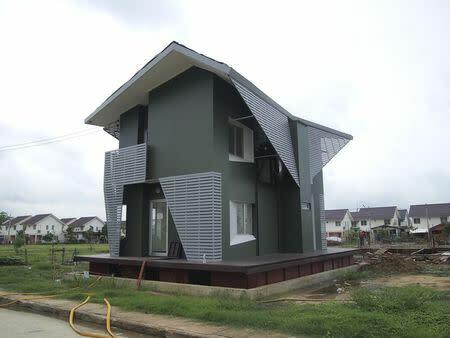 "We can try to build walls to keep the water out, but that might not be a sustainable permanent solution," said architect Chuta Sinthuphan of Site-Specific Co. Ltd, the firm that designed and built the house for Thailand's National Housing Authority. "It's better not to fight nature, but to work with nature, and amphibious architecture is one answer," said Chuta, who is organizing the first international conference on amphibious architecture in Bangkok in late August. Asia is the region most affected by disasters, with 714,000 deaths from natural disasters between 2004 and 2013 - more than triple the previous decade - and economic losses topping $560 billion, according to the United Nations. Some 2.1 billion people live in the region's fast-growing cities and towns, and many of these urban areas are located in vulnerable low-lying coastal areas and river deltas, with the poorest and most marginalized communities often waterlogged year-round. For Thailand, which endures annual floods during its monsoon season, the worsening flood risks became clear in 2011 as panicked Bangkok residents rushed to sandbag and build retaining walls to keep their homes from flooding. Vast parts of the capital – which is normally protected from the seasonal floods – were hit, as were factories at enormous industrial estates in nearby provinces such as Ayutthaya. Damage and losses reached $50 billion, according to the World Bank. And the situation is worsening. A 2013 World Bank-OECD study forecast average global flood losses multiplying from $6 billion per year in 2005 to $52 billion a year by 2050. In Thailand, as across the region, more and more construction projects are returning to using traditional structures to deal with floods, such as stilts and buildings on barges or rafts. Bangkok is now taking bids for the construction of a 300-bed hospital for the elderly that will be built four meters above the ground, supported by a structure set on flood-prone land near shrimp and sea-salt farms in the city's southernmost district on the Gulf of Thailand, said Supachai Tantikom, an advisor to the governor. For Thailand's National Housing Authority (NHA) – a state enterprise that focuses on low-income housing – the 2011 floods reshaped the agency's goals, and led to experiments in coping with more extreme weather. The amphibious house, built over a manmade hole that can be flooded, was completed and tested in September 2013. The home rose 85 cm (2.8 feet) as the large dugout space under the house was filled with water. In August, construction is set to begin on another flood-resistant project – a 3 million baht ($93,000) floating one-storey house on a lake near Bangkok's main international airport. "Right now we're testing this in order to understand the parameters. Who knows? Maybe in the future there might be even more flooding... and we would need to have permanent housing like this," said Thepa Chansiri, director of the NHA's department of research and development. The 100 square meter (1,000 square foot) floating house will be anchored to the lakeshore, complete with electricity and flexible-pipe plumbing. Like the amphibious house, the floating house is an experiment for the NHA to understand what construction materials work best and how fast such housing could be built in the event of floods and displacement. The projects in Thailand are a throwback to an era when Bangkok was known as the Venice of the East, with canals that crisscrossed the city serving as key transportation routes. At that time, most residents lived on water or land that was regularly inundated. "One of the best projects I've seen to cope with climate-related disasters is Bangkok in 1850. The city was 90 percent on water - living on barges on water," said Koen Olthuis, founder of Waterstudio, a Dutch architecture and urban planning firm. "There was no flood risk, there was no damage. The water came, the houses moved up and down," he said by telephone from the Netherlands. Olthuis started Waterstudio in 2003 because he was frustrated that the Dutch were building on land in a flood-prone country surrounded by water, while people who lived in houseboats on the water in Amsterdam "never had to worry about flooding". His firm now trains people from around the world in techniques they can adapt for their countries. It balances high-end projects in Dubai and the Maldives with work in slums in countries such as Bangladesh, Uganda and Indonesia. One common solution for vulnerable communities has been to relocate them to higher ground outside urban areas - but many people work in the city and do not want to move. Olthuis says the solution is to expand cities onto the water. Waterstudio has designed a shipping container that floats on a simple frame containing 15,000 plastic bottles. The structure can be used as a school, bakery or Internet cafe. Waterstudio's aim is to test these containers in Bangladesh slums, giving communities flood-safe floating public structures that would not take up land, interfere with municipal rules or threaten landowners who don't want permanent new slums. "Many cities worldwide have sold their land to developers... and now when we go to them, we say, 'You don't have land anymore, but you have water,'" Olthuis said. "If your community is affected by water, the safest place to be is on the water."